Merino is a luxury fiber and as such, you will not find chunky merino wool products in conventional shops and stores. Unspun, pure, merino wool is a joy to knit with. It is incredibly soft and stretchy. It is easy to knit and at this scale the results are fast and dramatic. Merino fibers allow for excellent temperature regulation and breathability. When you are cold, merino keeps you warm thanks to its structure. When warm, the wool takes on a cooling effect. Merino wool is hypoallergenic which mean those who suffer from allergies and/or hayfever can be rest assured when using this fabric in their homes. Merino fibers deter allergens; it's no wonder this is the "go-to" wool for newborn babies and their sensitive skin. Merino wool is also flame, water, odor and stain resistant! It is a self-cleaning wool therefore a perfect houseware fabric particularly in homes where toddlers are running about! Lastly, merino is very malleable. It will stretch, bend and adapt to your use, without losing its' shape or structure. Quite simply, merino wool is a miracle fiber! Merino wool products require special care as it is an unusual fiber, particularly in blankets. Due to the nature of merino, pilling and balling is common. Please be aware that pilling is not a defect, it is merely a by product of using 100% unspun merino wool. Before and after knitting, I semi hand felt each product to help reduce the pilling that will take place, however, initially, with touch and use, friction will contribute to further pilling. Ironically, the more you engage with your merino, and the older it becomes the better the fibers bind together and pilling will reduce. I recommend you carefully pull or scissor off any pilling you may observe after receiving your Chunky knit. Over time, with use, the fibers will pill less leaving you with a beautifully felted merino wool product. Should you find your blanket has lost its "fluff," don't be afraid to gently pull the stitches apart as this will renew the bulkiness. When carefully cared for, merino wool products have longevity. *Dry clean only when necessary *Spot clean with cold water *Remove pills carefully *Shake to re-plump and re-shape. When building your own bespoke chunky, you have over 40 colours to select from, 4 sizes and 5 stitch options. The Chunky Needle offer over 40 colour options. When depicted on the website, close attention has been given to ensuring the colours have been accurately represented, however if you are unsure, we would recommend purchasing a sample(s) to see the exact colours available. If you are looking for a particular colour that isn't listed, do let us know, as we can source up to 100 variant shades. 5 standard sizes are available, however, The Chunky Needle can produce any size based upon your personal specifications. Just contact us to discuss your project in advance to placing an order. Be advised that the due to the nature of chunky knitting, the final sizes are approximate. Stitch type can affect the final size. 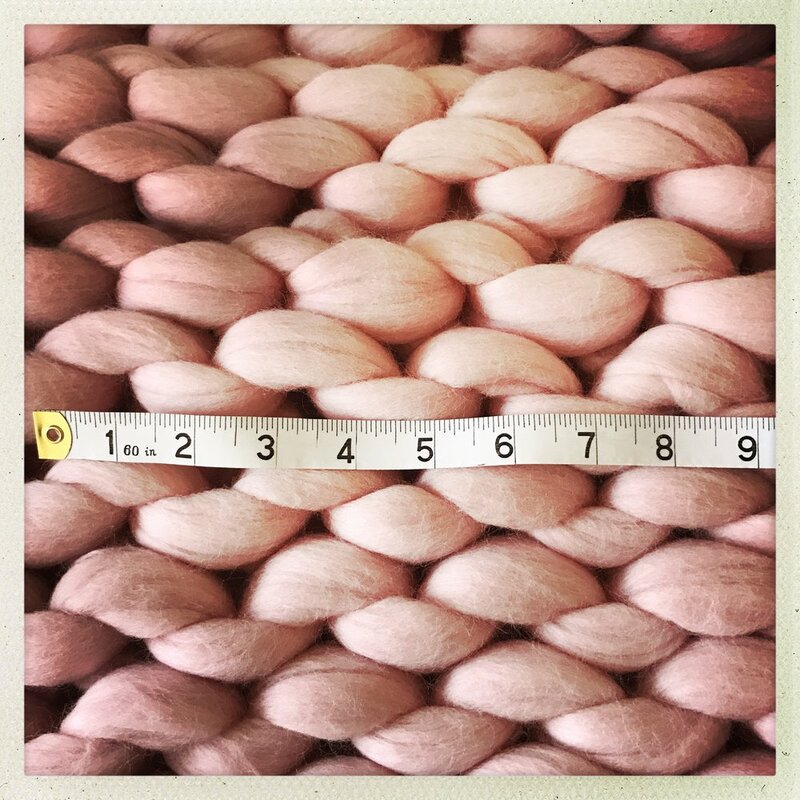 Merino wool products are quite malleable and can be manipulated (stretched) if need be. The Chunky Needle can produce your product in one of five stitch options. Please note, some stitches (ie: Stockinette vs Moss) will knit tighter than others therefore appearing to affect the final size of product despite using the same amount of wool. Don't hesitate to get in touch should you have further questions.